There are many fine makers and craftsmen working in wood in the Scottish Borders. Many of them have been showing, selling and exhibiting with us for years. Many work to commission and are only too pleased to discuss a project with you. The images below are a chapbook of products made by various individual craftsmen and women. There are makers here that have been asked to make furniture and fittings for kitchens to cathedrals. 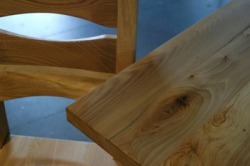 Nothing can substitute a visit to Buy Design to see real wood in a unique setting and to talk through your ideas with them in the gallery or their workshops.